Add this issue to your photographic library for techniques on close-up photography with Canon's close-up lenses, custom functions menu, birds in focus, multiple flash, movie mode and moving beyond the rectangle of the 35mm frame. Gallery Paris at night by Brian Matthews. Point-of-view Robert Scott examines the brightness range problem, looks at the latest idea from Canon, gets excited about focus stacking and wonders what the future holds in store. Close focus Close-up photography is very enjoyable and does not have to be costly. Canon’s high performance double-element close-up ‘D’ lenses are relatively inexpensive and easy to use. 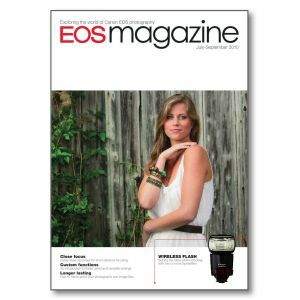 Custom camera Customise your EOS camera to suit the way you work. Andrew Gibson guides you through your camera’s custom functions menu and shows you how to set up your camera to meet your needs. Birds in focus Britain has an abundance of wild bird life. But what’s the best way to photograph birds at rest and in flight? We show you how to set your camera to capture sharp images of moving subjects. Longer lasting Are your photographs worth keeping? Are they just for the present, or are they a present for future generations? If you want your film and digital images to last 100 years, or more, read on. Balancing act A single Speedlite gives autoflash exposure. But what happens when you use two or more Speedlites together? How was it shot? Darwin Wiggett uses one of Canon’s tilt-and-shift lenses to produce square format pictures. He explains how – and why – he moves ‘beyond the rectangle’ of the 35mm frame. Movie world Canon’s latest EOS cameras all have a movie recording mode. Ian McNeill explains what you need to get started making your own home produced features.